My response is one that usually takes them aback. I tell them that the only people who have helped me to succeed in Hollywood are Jews. It was Jewish studio executives who gave me my first writing breaks, and Jewish writers, directors and producers have served as mentors and allies over the past decade. Without the help of Jews, this Muslim would still be writing scripts in a café somewhere, desperately hoping to find a way to break into Hollywood. Others are surprised when I say that, but I am not. I grew up in Borough Park, a primarily Jewish neighborhood in Brooklyn, and most of my close friends over the course of my life have been Jews. Despite our often passionate disagreements about Middle Eastern politics, my Jewish friends and I always find common ground in our shared experience of being a religious minority in a predominantly Christian country. Both American Jews and American Muslims know what it is like to feel out of place, to long for inclusion in a mainstream society that is often filled with ignorance and hate for our faiths. We know what it is like going to elementary school and being reviled by our classmates for not believing that Jesus is the Son of God. We know what it is like being mocked for having different customs at home, for celebrating holidays that our Christian neighbors have never heard of (and often can’t pronounce). We know what it is like to be preached to every day by neighbors trying to convert us and “save our souls.” We know what it is like to be told that our religion is inferior to Christianity by people who do not understand even the most basic tenets of our faiths (as well as their own). Despite the real political differences that exist over Middle East policy between members of our communities, we have a common bond of being outsiders, of being the misunderstood “other” in a Christian world. And that common bond has always allowed me to transcend political differences with my Jewish friends and meet them on the field of shared loneliness that is the lot of those who are different. And that is why it breaks my heart to watch a respected Jewish organization like the Anti-Defamation League fall into the abyss of anti-Muslim bigotry over the past several years. Many Americans, including many Jews, have expressed shock at the ADL’s recent announcement that it sides with bigots and fear-mongers who oppose the building of the Cordoba House Islamic center in southern Manhattan. Regrettably, I am not surprised. The ADL, which was founded in 1913 as a powerful voice against religious discrimination in America, has over the past decade become increasingly xenophobic toward the Muslim community, which its leaders seem to view as a threat to Jews due to its lack of support for Israel. As a Christian friend who works in the Obama Administration lamented to me recently, the ADL has in essence become the “Pro-Defamation League” when it comes to Islam and Muslims. The recent comments by Abraham Foxman, National Director of the ADL, against the proposed Muslim community center in New York are the latest in a long line of incidents where members of the ADL have promoted bigotry and discrimination against Arabs and Muslims. In 1993, the ADL illegally spied on American citizens who had spoken out in sympathy with Palestinians, generating a list of 10,000 names of private citizens and over 600 groups in their files, and then selling the list to South African intelligence agents. The ADL was sued for violating privacy rights and settled out of court. But the organization did not learn its lesson. Through the past decade, it has regularly organized smear campaigns around Muslim leaders and conferences, falsely imputing terrorist sympathies to some of the most moderate and respected leaders of the community. To be fair, the ADL has in a few instances spoken up in defense of Muslim civil rights, notably when the topic of Israel is not involved. The ADL publicly denounced the ethnic cleansing of Muslims in Bosnia and criticized the Swiss government for amending the constitution in 2009 to prevent the building of mosque minarets. But the preponderance of its actions over the past decade have made it clear that when Muslim grievances against Israel are raised, the ADL will firmly side with its co-religionists rather than adhere to its underlying mission of standing for justice and equality for all humanity. On some level, perhaps that is understandable, if not excusable. But what is particularly shocking about the recent statements against the Cordoba House is that the ADL appears to have moved from a knee-jerk defense of Israel to an aggressive stance attacking American Muslims even when there is no criticism of Israel involved. I have written at length on the Huffington Post about the founders of the Cordoba House and how they represent progressive Islam and embrace people of all religions, including Jews. I know Daisy Khan personally and she is a gracious and gentle woman who espouses love and wisdom, not hate. The writings of Imam Feisal Abdul Rauf continue to inspire me and countless mainstream Muslims to improve our communities and defeat the extremists that threaten to corrupt Islam from within. The opponents of the Islamic Center have gone out of their way to vilify and defame these honorable people, who are leaders of the moderate Islam that the media is always claiming doesn’t exist. Muslim leaders like Daisy Khan and Imam Abdul Rauf have endured with great dignity the double-pronged attack from their enemies. First, the media spreads the lie that Muslim leaders like them do not speak out against terrorism. And when they do speak out, they are either ignored or lumped in with the very extremists they are fighting. The Cordoba House is exactly the voice of moderate Islam that needs to be highlighted at a time when Muslim extremists and anti-Muslim bigots both want Islam, a spiritual path of great beauty, to be seen as a religion of hate and death. But what is particularly painful for me as a Muslim is to watch how a group like the ADL, born out of the horrible experience of anti-Semitism and bigotry in America, can so easily turn its back on its heritage in order to join forces with the voices of hate and division. If any community knows what it is like to be branded with false stereotypes, to have the innocent condemned as guilty, it is the long-suffering Jewish people. To have its leaders now embrace the mindless, drunken crowd in its march of hate against a fellow religious minority’s right of worship, it is beyond obscene. And it is a fundamental rejection of everything that Judaism stands for. 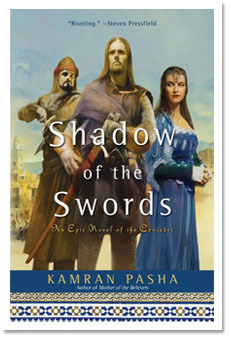 In my latest novel, Shadow of the Swords, I delve deeply into the character of Maimonides, the great Jewish rabbi, who was friend and advisor to the Muslim sultan Saladin during the Crusades. In examining the experience of Maimonides, a Jew living as a minority among Muslims, I sought to demonstrate the ancient sympathy and understanding that Jews and Muslims had for each other at a time when both were being targeted by Christian persecutors. And I sought to share with my readers that the tenets of Judaism have always stood for social justice, mercy and wisdom, and that this ethical commitment served as a link of common understanding between Judaism and Islam at a time when Christianity stood for ignorance, murder and barbarism. People who have read my book have expressed wonder at how two communities that were once intimate friends have become so estranged in the past century. The reasons for these modern divisions are long and complex, and are mainly linked to the trauma of Western colonization of the Muslim world, and the horrific experience of the Palestinians as a result of the creation of Israel that was the byproduct of that colonial history. Despite efforts by some Christians and Jews (as well as extremists among Muslims) to portray the current tensions between these communities as rooted in theological and cultural foundations, the reality is that Jews and Muslims historically got along much better than either group did with European Christians. When the Spanish Inquisition expelled Jews from Spain, where they had thrived under Muslim rule for 800 years, Spanish Jews found refuge in the Muslim Ottoman Empire and rose to positions of great economic and political power. What the current leadership of the ADL does not understand is that there is no ancient enmity between Jews and Muslims. If many Muslims have problems with Israel today, that arises from real grievances about the treatment of Palestinians, not inherent hatred for Judaism in Islamic culture. What the ADL appears to fear is that as Muslims become part of the American fabric of life, that their critiques of Israel will lead one day to United States abandoning its long-term ally. This fear is, frankly, insane. There is a place for dialogue, debate and disagreement about Middle Eastern politics among American citizens, and that discussion will not threaten Israel’s existence. As President Obama made abundantly clear in his speech to the Islamic world in Cairo last year, the bond between the United States and Israel is “unbreakable.” So Abraham Foxman should relax and take a breath. Muslim empowerment in the United States will not lead to a second Holocaust. Muslims praying at mosque in New York City will not lead to death camps and mass extermination of the Jewish community. Muslim voices joining the public forum will not add to anti-Semitism in America. But if the Jewish community is seen as willing to join in discrimination against innocent Americans to promote its own agenda – that perception will fulfill every anti-Semite’s ugly and false perception of the Jewish community as a self-serving and hypocritical group that only cares about its own pain and not the pain of others. That ugly vision is not the Judaism I studied in college, the Judaism of Maimonides and Martin Buber, nor does it reflect the Judaism that I have experienced in my relationships with Jews all my life. But it appears to be the cheap and unworthy vision of the ADL leadership, and as such dishonors the Jewish legacy to this world. The Judaism that I admire, that I write about in my novel, is the true Judaism of love for mankind, of humility before God, of service and compassion. It is the Judaism that stands for the rights of the weak and the oppressed against the arrogance of those in power. It is the Judaism of Moses standing in defiance of the Pharaoh on behalf of a group of powerless slaves. It is the Judaism of Rabbi Hillel, one of the greatest religious visionaries of all time. Decades before Jesus Christ proclaimed the Golden Rule, Rabbi Hillel is famed for his response to a questioner who wanted to know the essence of Judaism, of the Torah, in the time it took him to stand on one foot. Hillel responded that the whole of the Torah could be summarized in one sentence. To Mr. Foxman and the rest of the ADL leadeship, I ask if in your hearts you would want people to accuse innocent Jews of being enemies of the state? Would you want Jews to accept vilification of their entire religion if a handful of Jews ever did something wrong? Would you want Jews to tacitly accept the lies that bigots had projected on to them? And finally, would you want Jews to be forced to shut down their synagogues because of the misguided passions of a mob? Would you want this done to Jews? If the answer is no, then I ask as your Muslim brother that you follow the wisdom of Rabbi Hillel and the sages of Judaism. Do not do the same hateful thing to my people. You are currently browsing the Kamran Pasha's Blog blog archives for August, 2010.